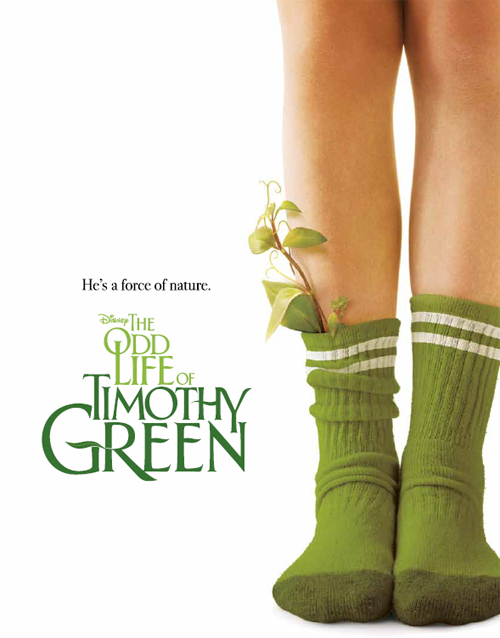 The Odd Life of Timothy Green is a a new movie by Disney that is the story of a couple, Cindy and Jim Green (played by Jennifer Garner and Joel Edgerton), who desperately want to have a child of their own, but are only left with their dreams of who he might be. Suddenly, Timothy (played by CJ Adams) shows up at their house after a storm and they learn that sometimes the unexpected can bring some of life’s greatest gifts. 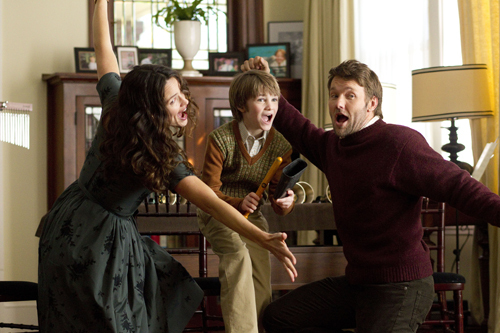 David and I went to a special early screening of The Odd Life of Timothy Green. I had seen the previews and it seemed like a story that I would like, so I was looking very forward to it. Well, like isn’t a strong enough word…I loved it. And it had me crying like a baby in several spots too (just as I suspected). 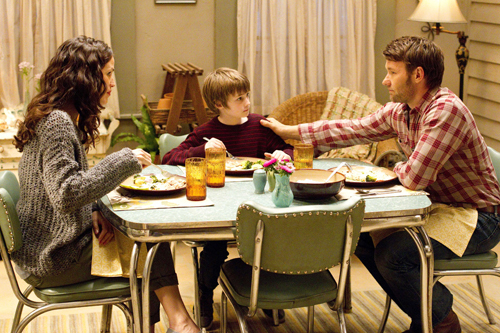 I have so many parts of The Odd Life of Timothy Green that touched me. One of my favorite scenes is this one you see above. You’ll have to see it, to figure out why I liked this part so much. But there was something else that I loved about this movie. It supported what I believe: that every child is special and extraordinary, just like Timothy Green — even if they are so-called “different”. I wish every child in this world could be loved by parents who see their child as something amazing….I know there is lots that do, but I wish this could happen for every single child. In the movie, Cindy Green has a garden and she tells Timothy at some point that they eat lots of healthy foods from that garden (I can’t be sure her exact wording, but something like that). I don’t have a garden, but, we still enjoy eating meals that are full of wonderful vegetables and fruits, whether from the grocery store or the farmer’s market. One of our favorite dinners is having our own salad bar at home . Everyone in our home enjoys having a big salad for dinner in the summer! Oh, and the more toppings, the better! 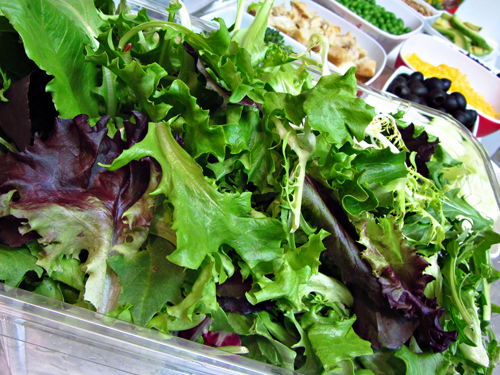 If you have a vegetable garden, you could have garden fresh salads…yummm! 1. I buy a big bag or tub of salad greens that is already pre-washed and ready to go. 2. I prep all the vegetables and other salad toppings. Everything is placed in it’s own bowl and all of these bowls are set out on your kitchen counter. 3. After everything is prepped and on our kitchen counter, I call the kids and they come in and make their own salads, just like they might at a salad bar at a restaurant. Everyone’s salad always looks a little bit different and that’s the great beauty of these types of meals. 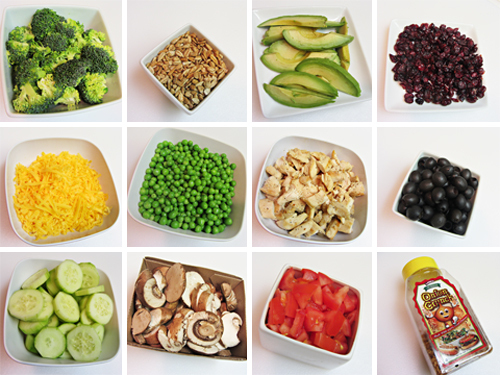 With so many healthy ingredients, you can’t go wrong…well, maybe as long as you don’t go overboard on cheese! But, I imagine, this dinner would be Cindy Green approved. Disclosure: I was invited to a complimentary screening of The Odd Life of Timothy Green. All opinions are 100% my own. Thanks again for your support of Onion Crunch!! 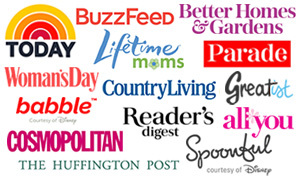 We are going to post your blog on FB and send out a Tweet! 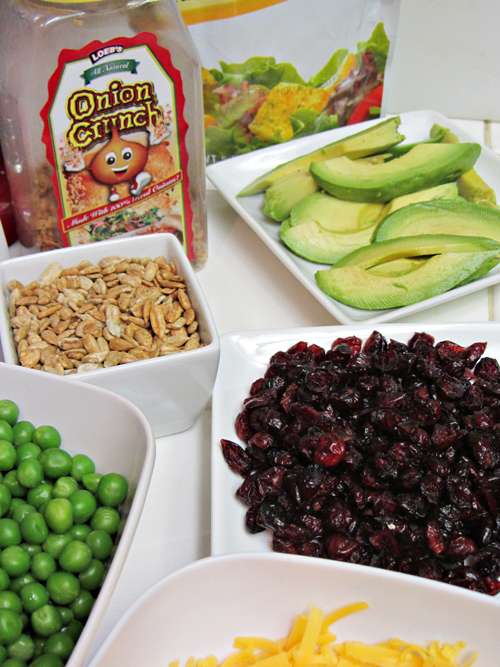 What a great idea to have an at-home salad bar like this. So colorful and healthful! I did enjoy that scene in the film, as well. Your images are beautiful, Brandie! And, I just have to say, anytime I see those onion crunch things I think of your famous tweet story. Too funny. Oh my gosh…I am SO looking forward to seeing this movie…and I know that I’ll be crying like a baby, too (case in point, the commercials make me tear up – and so did just “hearing” you talk about it…big…baby). I know we’ll be taking the kids to this one. That salads looks amazing, btw! I love this movie too! 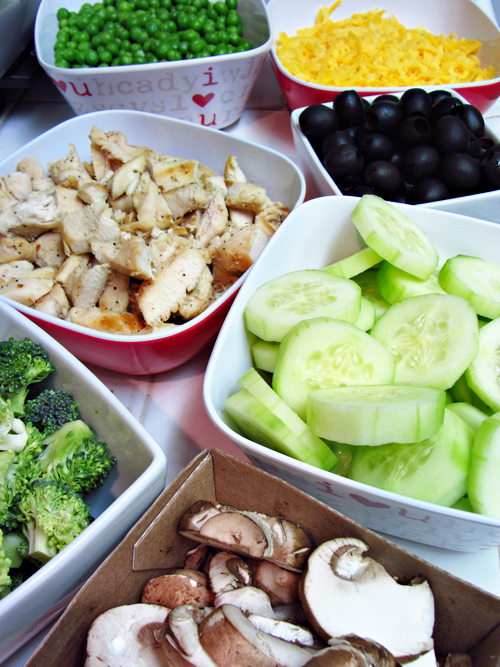 – I have never thought of making a homemade salad bar – I don’t know why.. I just seem to pile everything into the bowl.. — Thanks for the great idea, I’m so doing this!! Brandie, YUM!! I love all things salad and you made this look delectable. Something savory about sweet and salty together. Awesome! Your salad looks delicious too! 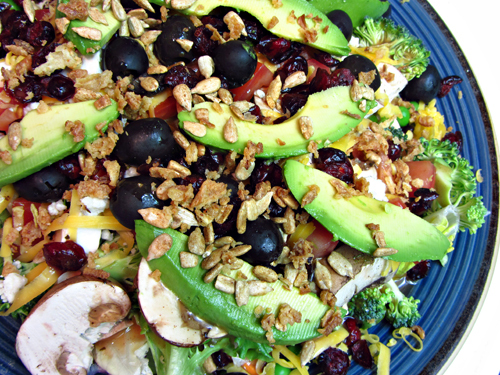 Living in the desert, salads are a must have for hot Summer months. I loved the movie too by the way! I think you’ll really like it, Kristy. I saw it with my husband, but I’m looking forward to taking the kids to see it. And my kids too…makes it much more fun for them.